Looking for Newport Beach bee removal? The Bee Man specializes in minimizing property damage due to bee infestations. Beehives can cause tremendous damage. If not treated quickly and effectively, a minor infestation can grow into a much larger problem. Beehives can cause serious property damage. First of all, bees look for small entry points, usually on a rooftop, chimney or eaves. As a result, these locations make it difficult to access and are usually behind some stucco wall or tile. The bees themselves will build a hive that can weigh over 100 pounds. Consequently, the weight of the hive can cause stress on the framing. The hive itself can ooze honey, wax, and waste into the wall. This discharge could lead to mold if not treated properly. Furthermore, going in to remove a hive can also cause a lot of damage. Most of the times we need to saw right through the wall to gain direct access. Because we have over 40 years experience in performing ONLY bee removals, we can determine where the hive is in the wall without having to tear up more of the wall than necessary. 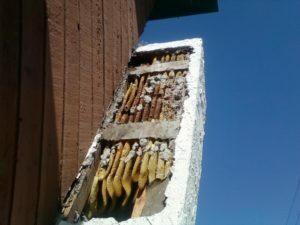 Therefore, repairing the wall after the hive removal is easier and less expensive. As a result of our experience, we can minimize property damage caused by the bee infestation and the process of removing the bees themselves. The Bee Man offers professional Newport Beach bee removal services to residents and commercial customers 24/7. Please note that we advise not disturbing any bee infestation you may have. Consequently, please refer to our safety tips here. Finally, if you need any Newport Beach bee removal, please contact The Bee Man at (949) 455-0123 before any property damage occurs.